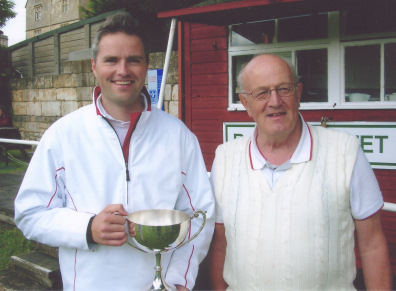 Glastonbury Festival-esq weather greeted the 16 intrepid competitors at Bath Croquet Club’s flagship handicap tournament on the last weekend of June. The weather had been so bad in the run up to the tourament that one competitor even phoned the tournament secretary to check that the event was going ahead – and he was the cup holder! Despite the constant drizzle and rain on the first day the standard of play, high spirts and good humour amongst the players was excellent. The players were divided into 4 blocks of roughly even handicaps and played the other 3 members of their block. Performance of the first round came from Bath President and twice winner of the Millennium Cup Bob Whitaker (10). George Woolhouse (4) of Letchworth was dispatched +26 in less than an hour with one bisque standing! Both Andrew Willis (7) of Bath and Chris Donvovan (4.5) of High Wycombe left it very late to beat Rosemary Bradshaw (18) of Fowey in Cornwall and Julie Horsley (14) of Budleigh Salterton respectively by just 3 points. Richard Smith with a handicap of 0.5 was by far the lowest handicap player in the event and also had to come from behind to defeat Bath player David Perkins (11) by 7 points. In the 2nd and 3rd rounds Ian Lewis (4) of Bath (the 2005 winner), Andrew Willis, Chris Donovan (the holder) and Gordon Weir (7) of Cheltenham all showed good form and recorded comfortable wins, ending the day top of their respective blocks with 3 wins out of 3. Sunday saw tournament manager Daniel Mills arriving 30 minutes late, but thanks to mobile phone technology the playing schedule was communicated to Referee of the Tournament Bob Whitaker before 9-30am! In the most closely fought of the quarter-finals Michael Poole (7) of Bear of Rodborough came through by just 2 points against Gordon Weir. Richard Harris (18) of Ryde on the Isle of Wight had improved during Saturday’s play after losing his first game, but he was no match for Ian Lewis in the quarter-finals and went down by 19 points despite having 14 bisques! Andrew Willis beat Julie Horsley by 14 and Chris Donovan overcame Rosemary Bradshaw by just 6 points. In a closely contested semi-final Ian Lewis eventually defeated Chris Donovan by 9 points. In the other semi-final Andrew Willis was in unstoppable form in beating Michael Poole by 25 and actually scoring hoop 1 for Michael in the process! The final was also a rather one sided affair because Andrew armed with 3 bisques simply went round twice and won by +26, giving Ian only 2 shots. The whole weekend was a magnificent performance by Andrew, who has only been playing croquet for 2 years, and in the process he won his silver award and a handicap reduction to 6.